The Omphalos, centre of mythic Greece. 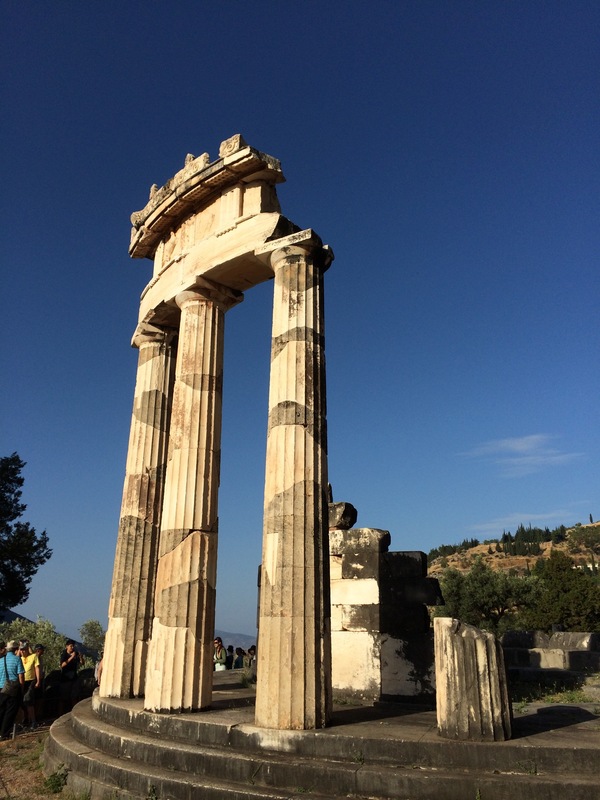 If there’s a place in Greece that stands on the border between myth and history, it’s Delphi. Its origins are lost in legend and folktale, but the fact of its influence and wealth can be seen in the incredible physical remains of the place. According to one tale, the Omphalos above marks the spot where two eagles that Zeus released from the edge of the world finally met. According to another, it was the stone that Rhea fed to Chronos instead of the infant Zeus, and Delphi is where it fell when Chronos vomited it up. Neither tale did anything more than burnish the already hallowed reputation of Delphi. The sanctuary of Apollo was where kings and emperors sought out the wisdom of the Sibyl, known as the Pythia, when they wished to know what the future held. When Leonidas of Sparta was told that a king’s blood must water the earth of Thermopylae if Greece was to resist Xerxes’ Persians, he strapped on his shield and went for a walk, taking only 300 bodyguards with him. Or so the story goes. That the priests of Apollo were able to keep this gig going for centuries can be seen in the fact that the sanctuary was rebuilt at least twice, each time more magnificent than before. Until the Christian Era at last put an end to pagan superstition, Delphi endured. Even now, there’s something special about the place. Perched high in a valley above the Gulf of Corinth, bees still buzz in the trees there, and olives are grown in the soil below, much as they must have been in ancient times. If you go there yourself, go at dawn or dusk, preferably the former. Sunrise over Delphi is something special, and it’ll keep you out of the worst heat of the day. Walk the same path that pilgrims seeking Apollo’s wisdom once did and savour having the place to yourself before the tour buses arrive. The Tholos of the Santuary of Athena at Delphi. If I’d stuck to the plan I made yesterday, I’d be mentioning Thebes now, home of legendary Oedipus, that most complex rex, but also Epaminondas and Pelopidas, two very historical figures who broke Sparta’s power at the Battle of Leuctra. Sadly, either the bus didn’t stop there or Alexander the Great did a too-thorough job when he razed it, as I didn’t see anything resembling a city, ancient or otherwise. Instead, I did a Chicago, passing swiftly through Athens, across the Corinthian isthmus to Nafplio. 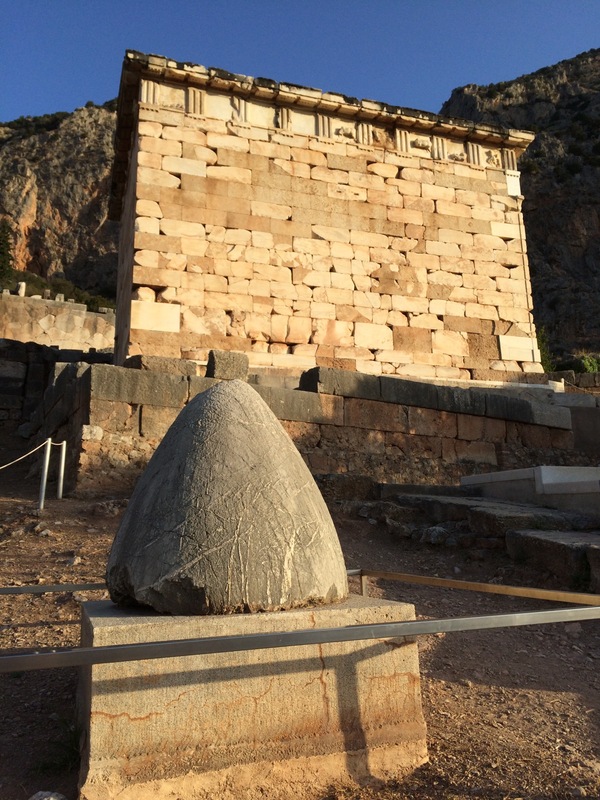 If Delphi is half myth and half history, Nafplio has only a scrap of myth left to it. There are Mycenean walls beneath one of its fortresses, but the most of the stone here is nailed down to well-understood history. The imposing Fortress of Palmidi, which rears high above the city, is less than three hundred years old, for all that several of its many fortifications have been named for figures of Greek myth and legend. The climb to Palmidi isn’t for the faint of lung, but the view is worth it. I got to the top just in time to watch the sun going down over the mountains on the far side of the bay and sat there looking at the much older city acropolis below until I was ready to try the stairs again. All that exertion is done for the day though. As I write this, I have a beer in front of me on a balmy Aegean night. Not long ago, I was strolling along the waterfront enjoying a (real Italian) gelato in the dying light of the day. If that isn’t what a holiday is supposed to be, I’m not sure I want to be part of it. 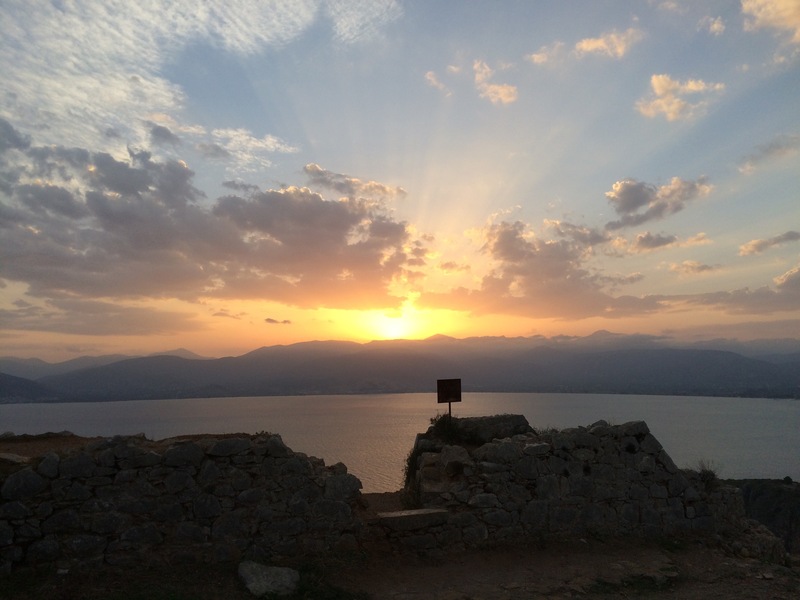 Sunset from the Palmidi fortress.